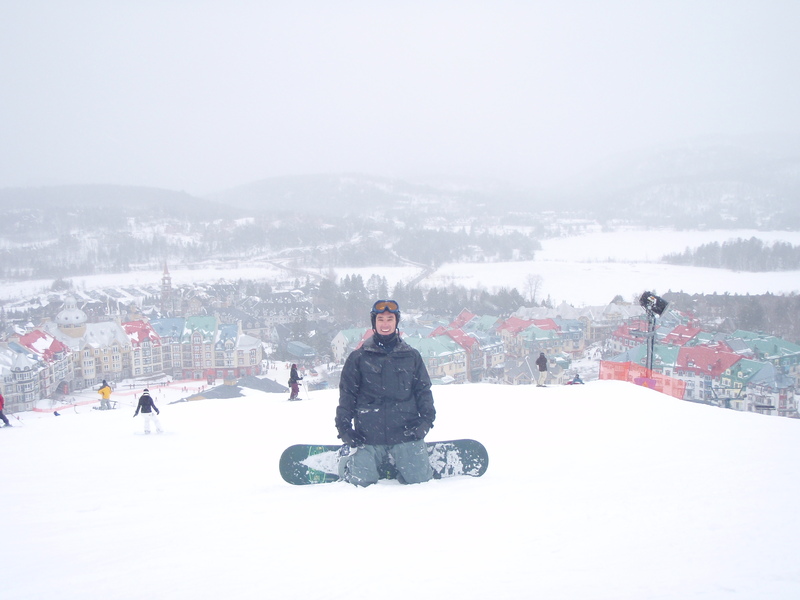 After five days at Mont Tremblant near Montreal, Canada I am officially back. What an awesome trip it was. Mont Tremblant far exceeded my expectations. My hopes were not up because I had a feeling that it was not going to be able to compare with the places out west in Colorado and Wyoming that I have been too. Luckily for us, it snowed every day we were there. Nothing crazy, but 3 to 7 inches is plenty to soften up the runs to make a good wipe out not hurt as much. The mountain was bigger than I expected and the runs were long enough to get from top to bottom without feeling dead tired but still making it feel like big mountain skiing. The village was a lot of fun with its cool bars and restaurants and the nightlife was not too shabby either. I brought my snowboard, skis, and snowblades there and did all of them on different days. My favorite had to be the days I used my snowblades on. They are just so much fun because I could turn on a dime. Since they were that much smaller I did feel a bit more pressure being put on my knees to stay up on them. We decided this year to only do the afternoon ski on 3 days and a full day on the last one. The difference in price from a full day pass to a half day pass was $77 to $59 in Canadian $$. Four hours on the slopes going all out is a very good workout to begin with. In the past we have pushed ourselves all day and had nothing left for the next day. I will say that I felt like I was in very good shape and did not feel sore at all. As a matter of fact, the most muscle discomfort I had was sitting in a Ford F-150 with 4 other guys for 11 hours there and 11 hours back to Detroit. All of the P90X I had done before I left made the trip that much more enjoyable. I did the legs and plyometrics workouts more than I normally do to get the legs ready for 4 days of raging on the slopes. 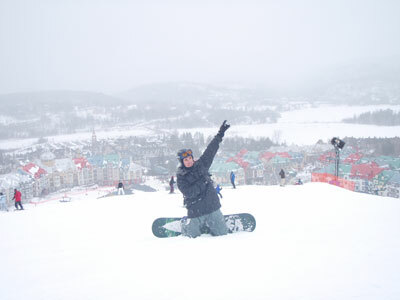 I give the trip to Mont Tremblant “Two Thumbs Up” and I would definitely go back there again. Its that time of year again when me and some friends of mine head off for our annual “Mancation.” We have been going on this trip for about 6 years now. This will be the first year when we do not fly somewhere. Economy stinks around here in Michigan and we are all counting our pennies. Instead we have gone on the idea of driving 11 hours from Detroit to basically Montreal instead. It sounded like a lot but when you think about the hour it takes to get to the airport to be two hours there before your flight, plus flight time, then getting a rental car and driving to the hotel it takes about 11 hours anyways. Even if we spend $400 in gas, that would only be one plane ticket. With 5 of us driving in a Ford F-150 (its gonna be tight with 5 dudes) and splitting the bill its going to be about $80 per person there and back for gas…hopefully. Mont Tremblant does not look like the mountains out in Colorado, or Wyoming that I have been to recently. This one is defintely smaller. It does keep up with our theme of no repeat trips so this will work. I decided to get a couple quick workouts in before we left. I did Kenpo X for the first time in awhile on Monday. For Tuesday I went to the gym and did 3 miles on the treadmill with a .5 mile swim and did a round of plyometrics. I am feeling sore all up and down my back today though. I think it was because I wore “weighted gloves” for the first time doing a workout with Kenpo. That little extra weight made a big difference. The plyometrics was necessary to get my legs ready for 3 full days of shredding. I will update next week when I get back if I did anything awesome on the slopes. Rage!! Thursday (2/19/09) We show up in Quebec at 8 am after driving in snow through the night and head right to the mountain. Conditions were awesome with fresh powder. I brought out my snowboard and did that the whole day. Surprisingly, I felt fresh while getting maybe an hour of sleep. Legs felt strong the whole time. Friday (2/20/09) Busted out the snowblades I got for Christmas and had a great time on those for about 4 hours that day. They worked a lot of muscles around my knees and my lower back. Realized I needed to stay in a lowered crouched position to keep my balance without falling. Again, felt great after skiing. Saturday (2/21/09) Brought out my skis today. It was my first time skiing this year and it was not as fun as yesterday because we stayed up a little bit later the night before and I was just tired out on the slopes. I still went all out and had a good time. Legs are still feeling good. Sunday (2/22/09) For my last day at Mont Tremblant my buddy Dave and I went all day. It kept on snowing the whole time we were there so there was 2 inches of freshies out there. I enjoyed the snowblades so much I figured to end the trip with those. Didn’t feel sore after getting at it for 6 hours. My knees were a little achy but this is expected because of all the banging the knees take from hitting bumps. We were not going to be able to drive all the way back to Detroit that night. We left right from the mountain driving for 4 hours and made it to Kingston for the night leaving us with a 6 hour drive in the morning.